Many of you might be familiar with Highway Pursuit. Once it was a very popular racing game. 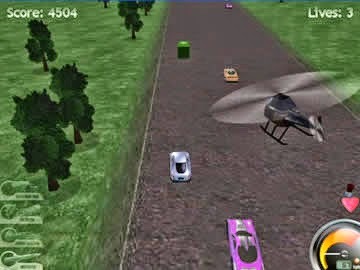 But large games like NFS, Formula 1, GTA have overtaken the tiny games like highway pursuit. Still many users search for small games. So I've decided to share these games with those people who like to play these tiny games. No Special Requirement. It's fast, easy and enjoyable . . .
Download the zipped file from the above link. 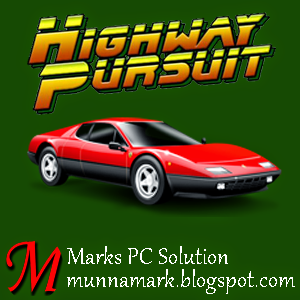 Go to the Highway Pursuit Folder and find HP.exe > Double click on it to run the game. While playing this game you will get a guide called Ashley. You will just hear her voice. She will guide you throughout the game. You will have three lives. There are 5 types of cars. The silver car is yours. Pink and Yellow car is your enemy. You can kill them by firing. The other two is civilian. If you kill the civilian car, you will not get the point. There is a green jeep. This is your enemy too. You can't bust it by firing. You can hit this to kill. Besides there are 5 vans. Ashley will tell you Weapon Van Ahead when you're near to a van. You can touch these vans when weapon needed. Ashley will warn you when the chopper is closing on your position. She will also tell you if you're near to a broken bridge or smoke bomb. Tips: When you're end of your life, you will get the yellow van. If you enter inside the yellow van, you will be reset to full life. Don't try to take weapons if not necessary. Because it's risky to enter into a van. Hello Guys! Do you know this is gonna be a special post? Why? Because this will be the Post # 300! It's been more than two years since I started blogging. And as a single writer, 300 posts is not bad at all within this period. Look at the following script. It's showing the total number of posts and comments of Marks PC Solution. If you work with different software regularly, you must discover some of these have portable versions available. 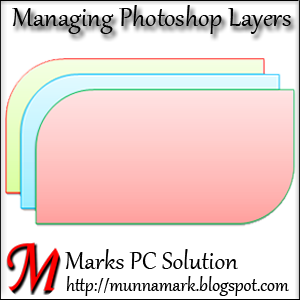 Most of the applications have portable versions. Whether the manufacturer releases portable version or not, you may collect it through third party software download site. Portable version has several advantages over regular installation version. And I will discuss about it. All of you are familiar with the word portable. When something is handy, movable or convenient to use, we call it portable. Even you may see portable TV. Portable Software is something like that. You can keep your portable applications anywhere. You can carry these applications with you through flash drives, portable hard drives or CD/DVD. 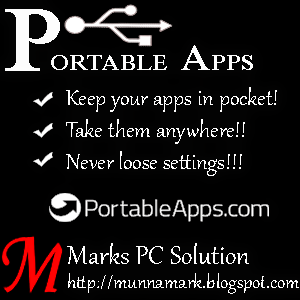 And you can use these portable applications in any PC simply by connecting your device. Once installed, portable applications would never need to be re-installed until you wanna upgrade it. Downloading from Websites: Only few manufacturers release their applications' portable version. While downloading applications, you can search whether portable versions are available or not. Portable Apps is the most popular site for downloading portable software. Thousands of software are ready to download at free of cost. You will be able to search software under different categories such as - Developers, Internet, Accessibility etc. And I think you will find your necessary applications from this site. But if something you need that is not available here, then you can search Google. Creating Portable Version: The second way is little bit difficult. If you can't find the portable version of your required application, then you can create a portable version from installed application! Install the application from .exe file. Now go to the program file and find that software. Copy the whole installation folder and keep it in a different drive other than your Windows drive (Usually C Drive). Now uninstall the software from your system. You can create portable version of most of the applications in this system. 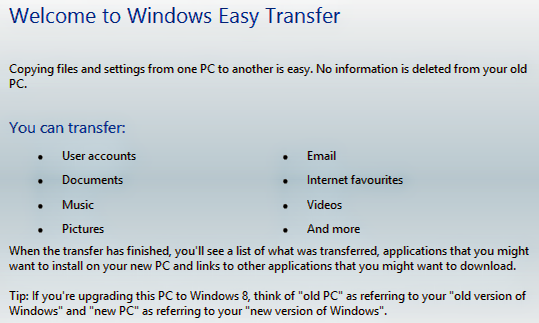 But it will not work in case of hardware driver, Microsoft office, adobe Photoshop etc. There are some programs to create portable version of any applications. I've never used such software. You have to find through Google. And the process is somewhat complex. Managing Portable Applications - Tips n Tricks! Keep the portable software in a different drive other than your Windows drive. You can also keep them in a pen drive or CD. Back them up when necessary. Locate the .exe file from your portable application folder. Example: Opera.exe, Chrome.exe, 7zip.exe. You can pin the application in start menu or task bar. Right click on the .exe file and then choose Pin to Taskbar or Pin to Start (In Windows 7 or 8). If you're using Windows XP, then right click on the application and then Send to Desktop (Shortcut). Portable applications will not be lost if you re install your Windows. After installing Windows, find the portable applications. Then create their shortcuts in desktop or task bar. By this time, maybe all of you got a mail from Google. It says - Gmail Update: Reach More People you Know. Basically this is a new feature added to Gmail. 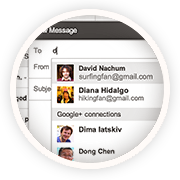 And with this feature, Google+ and Gmail get closer. Now you can contact those people who are already in your circles even you don't know your their email addresses! You should be a Google+ user with some circles. And of course you must have some people in your circles. 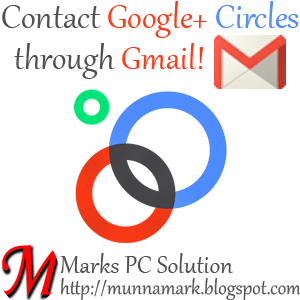 If you haven't created your circles and added some friends then visit Google+ to get some . . .
And if you wanna use this new feature, make sure you're using Gmail in Standard View. Basic HTML version of Gmail will not have this feature. If you're using basic HTML view, then you will find the Standard View option just at the bottom of the screen. Or at the top, just left to your email address. Once you click on the Standard View option, your Gmail will reload. Note: Standard view can't be used properly, if your net connection is too bad. As you know the privacy issue is related with this feature, emailing Google+ connections works little bit differently. Your email address will be kept invisible to your connections until you send then an email. And their email addresses will also be invisible until they respond. Those of you're using the Google Talk or Gmail Chat option, should understand the process. You can chat with your circles without knowing their emails. And from now, you can send message without knowing someone's email. If someone outside your cricles sends you message, this email will be filtered into the Social Category of your inbox. And if you wanna start conversation with them, you can simply respond to that email or add him to a circle. This new feature makes communicaiton more convenient. But some people may find this boring. Specially who receives too much emails everyday. Okay nothing to worry about. You can easily control who can contact you. Open Gmail in Standard View. Click on the Gear from upper right corner. 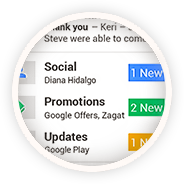 Scroll down to the Email Via Google+ sections from the General tab. 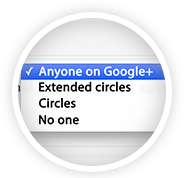 Hit on the Drop Down menu and choose any of them: Anyone on the Google+, Extended Circles, Circles, No One. When you're done, hit on the Save Changes from the bottom of the page. If you've regular interactions with social sites like Google+, Twitter or Facebook, you must understand, why Google brings this update! Facebook was about to take over the control of internet by introducing itself as social site. Though Google was somewhat late, but they also introduced Google+ few years later. And Google is trying to cover the mistake through Google+. But Google+ has not as many active users as Gmail. After this update, there will be a deep relation between Google+ and Gmail. Certainly this will give a boost to Google+. The number of active Google+ users will be increased. Google will be able to say, people are moving to Google+! Bloggers often need to add Java Scripts, Gadgets, Widgets etc. to their blogs. Adding widgets is a part of blog decoration. Since most of the bloggers have no coding or web designing knowledge, gadgets are truly helpful tools for them. I know almost all of you are capable of adding gadgets to your sites. But still new bloggers are not familiar with installing gadgets. So I'm gonna start the tutorial . . .
Sign in to Blogger Account > Go to Layout > Click Add a Gadget option > Choose your Gadget > Customize it if necessary > Save > Save Arranagement if necessary > View your Site. Note: You will find multiple Add a Gadget options in different locations of your layout. Select one from suitable position. Just below the Basics there are 870 more gadgets for you. If you are interested then browse the list. You can also search for your desired gadgets. If you're lucky, you may find one. 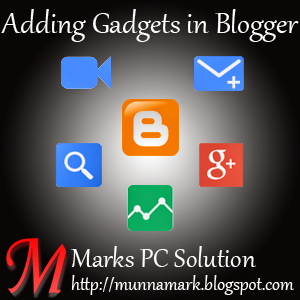 Blogger also allows you directly add gadget from URL. 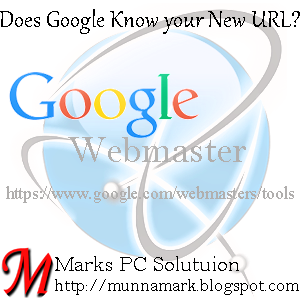 If you have any gadgets uploaded in a server then you can simply enter your URL and add gadget in your site. Don't Forget about Site Speed! To give your site a nice look, you must add gadgets. But it doesn't mean that you can add gadgets as and when you like one. Adding too many gadgets will significantly reduce your site's speed. Visitors never like to come back to a slow site. Statistics show that many readers ignore the sites which take more than 3 seconds to load! That means, if your site is heavier, then you're in a greater risk of losing potential visitors. Only add the gadgets which are essential. And remove all the unncessary gadgets from your site. While placing third party ads on your site, make sure they are not decreasing your site's loading time.